Faith is a spiritual knowledge of Christ. Period. 🙂 Faith is not a spiritual knowledge of the Bible. It is not even an acknowledgment of the fact that all Scripture points to Christ. And it is not some mere mental endorsement of man’s need to be saved from his dead and sinful condition by someone who is bigger than anyone who ever lived on earth before God Himself came down from heaven. Faith is more. But faith is not difficult, either. Below is another excerpt from Oswald Chambers where he describes the nature and consequences in the lives of those who have faith. In the Old Testament, personal relationship with God showed itself in separation, and this is symbolized in the life of Abraham by his separation from his country and from his kith and kin. Today the separation is more of a mental and moral separation from the way that those who are dearest to us look at things, that is, if they have not a personal relationship with God. Jesus Christ emphasized this (see Luke 14:26). Faith never knows where it is being led, but it loves and knows the One Who is leading. It is a life of Faith, not of intellect and reason, but a life of knowing Who makes us “go.” The root of faith is the knowledge of a Person, and one of the biggest snares is the idea that God is sure to lead us to success. Oh, what wonderful sentences!!! 🙂 I need to repeat them. Faith never knows where it is being led, but it loves and knows the One Who is leading. It is a life of Faith, not of intellect and reason, but a life of knowing Who makes us “go.” The root of faith is the knowledge of a Person. As long as we rely on our intellect and reason to tell us who God is, what He can do and what He certainly won’t do, we still miss the point. We will never be able to understand His guidance. We do not know what lies ahead and He won’t ask us whether we agree with the plans He has had for our own lives. I believe, God knows what is the best for us although I do not understand Him. How often I saw in the past that it was good for me to go through serious trials so that I learned to really trust in Him as soon as I had come to my wits’ end and/or to the end of my rope. Faith begins at the very moment when I realize… I have none (that is, in a certain area of life). Might sound a bit strange at first, however, as long as I was content with what I called faith in the past, I would not need God to give me more faith. It is indeed necessary that God leads us time and again into situations where no one can help us – but HE alone. As for the definition of knowledge here, I am speaking of knowing in the sense of loving God intimately and thus being able to attain spiritual maturity, not as islands in the spiritual realm, but together with all those who also possess the knowledge of God AND Christ AND of one another (Jn 17:3, 1 Jn 1:3). Since I do not want to be that repetitive, I simply point to another article I wrote recently on that very issue (see https://enteringthepromisedland.wordpress.com/2015/03/20/my-house-shall-be-a-house-of-prayer/). Finally, the consequences of knowing God as He really is cannot be overlooked by anyone as Jesus told us here. As a last word, Galatians 5:6 tells us that LOVE IS ALL WE NEED… 😉 since where there is love, there is faith also. “Faith is a spiritual knowledge of Christ.” Oh, how that quote packs a punch of truth. I appreciate this post, Susanne. I have known those who have Biblical knowledge, an intellectual knowledge that Jesus is the Son of God. But their lives showed little fruit. This has been a very real conundrum in my own soul as I couldn’t understand, I’m not sure I do even now. All I do know is for myself, and I am not an intellectual, nor a student of Scripture. But the risen Jesus has gripped my heart and it continues to slay me and guide me in unknown and powerful ways. What a gift! Truly! Oh, and I am happy to hear that the risen Jesus has gripped your heart intensely. Although it is anything but wonderful to be slayed, being raised with Him is glorious beyond anything we could have expected before. Yup, unknown and powerful are His ways, my sister!!! He also said that His sheep HEAR His voice and follow Him. They do not follow pastors and Bible teachers. If these men are doing their job they will always point people away from themselves and to Jesus as their ALL in all. Those who live by every word that proceeds from the mouth of God have His Word (Jesus is the Word of God) abiding and living in them. Without Christ abiding in us men can study the Bible until the cows come home and it will profit them nothing. That has been a comforting verse to me over the course of these last few years. Christ abiding in us, faith being a spiritual knowledge of Him…it’s such a thrill, not always easy – Lord knows. But worth it when more veils are lifted. Thank you for your encouragement, Michael! Feelings, in fact, can lead us into the wrong direction, no doubt, yet faith without feelings would bore us to death, I believe. Thanks for your encouraging words!!! Now I should really go to bed, I think. I even edited my reply to you seven times, Gabrielle. 3:34 am in Germany now….. Feeeeeeeeew ! Great piece. 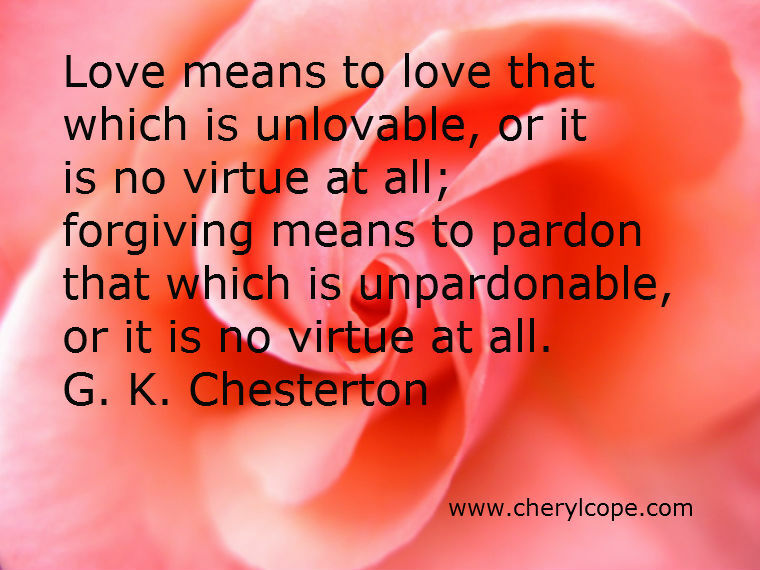 G.K. Chesterton is one of my favorites. Oh Sue what a golden post–I have a story I use to show the difference between epistemological knowing and ontological knowing–you have a sixteen year old virgin girl who wants to have a baby-she buys a book on how to get pregnant she reads and studies the book and it tells her the truth and she believes it–will she be pregnant? NO–she will only get pregnant by doing what the book tells her to do and she has to come into union with a male and receive his seed into her for new life to be created–the demons are a perfect example–they believe in the bible but they don’t have the life of God in them so there is no divine fruit–despite the knowledge they can only produce satanic fruit. Wowee!! Even “a golden post” – I never heard that before, but I love it, dear Kenneth! 🙂 Thank you so much for the encouragement! In fact, your story nails the essence of what has been said right smack on the head. What a beautiful example that even points to the deeper meaning of knowing God as well! Thanks again for sharing your story with me/us on here. We are directed to love one another, to live out our faith even when that seems impossible. All of us have mourned the Christians recently martyred overseas. But those men and women were witnesses to Christ in the face of hatred. The value of their sacrifice far exceeds the worldly glory many of today’s televangelists pursue. It is love as expressed through action that draws converts to Christ, not self-righteousness. Exactly! Nothing else will be able to soften a hardened heart than the unconditional love that shines through Christians into this dark world as you mentioned above. Susanne, I love the quotes and what you’ve shared in this post. I’m reminded of a scripture verse that has been meaningful to me in this regard in 2 Timothy1:12 where Paul says, “for I KNOW WHOM I have believed and am persuaded…” . This is indeed much deeper than saying, “for I know WHAT I have believed and am persuaded…” Knowing “what” has its place, but knowing “Whom” is to know the Faithful One, and that is where unshakeable faith springs from and is solidly anchored. Thank you for confirming this truth in a beautiful way! You’re so welcome, David. Thank you very much for your encouraging words! And yes, you’re absolutely right as to the meaning of “WHOM” in 2 Tim 1:12. Thank you, Susanne, for bringing out what real faith is. I love that quote that ties faith and knowing Who we believe in together! Another example of the knowledge that Christ is looking for is the difference between the lady behind the post office counter knowing who my wife is and the Dorothy that I KNOW. My knowing of my wife goes far deeper than a casual weekly greeting (read Sunday church going). My knowledge of Dorothy has produced four beautiful children that are gifts from God. Jesus is coming for His Bride, not a college of cardinals and Bible scholars. Intimacy with Christ as your husband is what produces fruit unto righteousness. Thanks Kenneth for your example as well. Indeed, it seems to me you just quoted parts of my (never published) book which I wrote in German and which you have not read, either. Exactly the same Scriptures as you mentioned above and very similar explanations. Isn’t it funny how God leads us all into the truth? 😉 And who has an open ear will hear….. Thanks so much for your enlightening words, my dear brother. “Behold, thou desirest truth in the inward being; therefore teach me wisdom in my secret heart.” (Psalms 51:6 RSVA). Susanne, it is such a joy to be one with you in spirit and in truth as we both abide IN Him together. Oh, what fellowship, oh, what joy divine as we rest together in His everlasting arms. Amen! Thank you, Susanne. Coming to hear His voice more clearly each day and our unity in the Spirit has truly been a wonderful experience. I am personally so grateful that Jesus gently draws me deeper from head-knowledge to heart knowing, on a daily basis. Prizing intellectual and academic life for many years , it is only God that has been able to show me how much more there is to relationship with him, I would not have heard or received this message from anyone else. Yes, Penny, it is all coming into our hearts from Him, for all good gifts come down from the Father of Lights. “In Him was life and the LIFE was the LIGHT of men.” Amen. Yes, it is always God who can show us what true love is all about. Hearing the message and experiencing His love are two very different “animals”. May you be blessed with every divine blessing in the days ahead! I will reply to all of you as soon as possible. Since today is another feast day in Germany, I am going to leave for a prayer biking tour now. Indeed, I forgot to mention Lily, and Sanne, and some others…. Feeeeeew! Sometimes I tend to forget my own name, too. Susanne my spirit witnesses yet again to the truth of these words, in fact I wrote such a poem last night about loving obedience to Christ which is the heart of knowing Him and His love. Going, walking out in faith is a power from heaven. I have no strength yet the Lord is leading me to the very places that cause pain and rejection. I cannot explain what is happening nor do I know the results of what I am doing but I am going where He leads and each step I take I know Jesus is right there with me even though I tremble as I see the looks. Faith never knows where it is being led, but it loves and knows the One Who is leading…… this is the line for me Susanne. Yet through this time a deeper more intimate walk is taking place, His voice clear, crystal clear. ‘If the world hates you then know that it hated me first’. I’ve been studying and speaking out the book of John which is packed with intimate revelation to his closest disciples. I believe at this time Jesus is drawing to himself those who are obedient even if those around them do not love them in return. What matters is not the fear of man as we walk in faith but knowing Jesus, yes the risen Jesus is walking with us, comforting us as we are aliens in this world. The joy is knowing Him the sorrow is seeing many walking in disobedience. No I do not know the outcome even if there is one, my work is to believe in the One whom the Father sent and to do His will and yes it is painful but the joy is knowing Him deeper and by golly I await the mansion prepared for me with God’s grace and help each day. Thank you Susanne, and the others who have replied to this post. I am being blessed with the truth that I read. Every divine blessing to you and Bernie!